As with most highly considered purchases, trusted experts and influences are a valuable asset when trying to decide what to buy. As part of our 2017 POPSUGAR Insights Auto Report, we surveyed over 1,200 US millennial female in-market auto shoppers to better understand their perspective on shopping for their next vehicle. 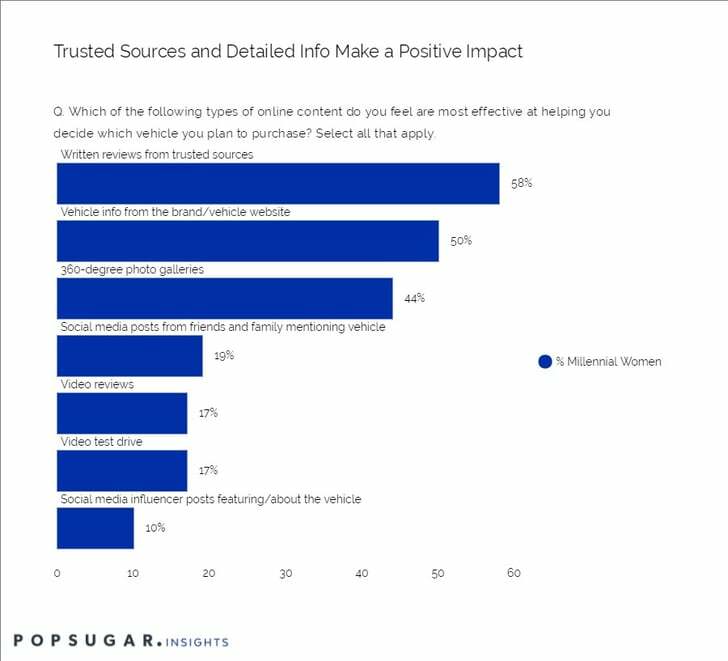 Overall, millennial women said that the most effective forms of online content to help them decide which vehicle to ultimately purchase include "written reviews from trusted sources" (58%), "vehicle info from the brand or vehicle website" (50%), and "360-degree photo galleries" (44%). Nearly 1 in 5 millennial women said that "social media posts from friends and family that mention the vehicle" are effective, as are "video reviews" (17%) and "video test drives" (17%).